It’s the middle of a calm night as you climb the ladder and board the Obra Dinn. The ship is completely empty, not a soul in sight. Bleached, 1-bit visuals make the ship’s edges look freckled and scratchy like someone has etched this whole vessel onto a chalkboard. The three lower decks are lined with cabins, cabinets, and closets. You’ll be getting to know every inch of this ship during your time here. It’s 1803 and a merchant ship once thought lost at sea has spookily drifted back to dock. It’s been four years since the Obra Dinn went missing. Now that it has returned to the British Isles, contracts must be drawn up and paperwork must be filed. Playing as an insurance evaluator, you’re given the chilling job of discovering and documenting the mysterious disappearances of 60 sailors and passengers that were once aboard this ship. 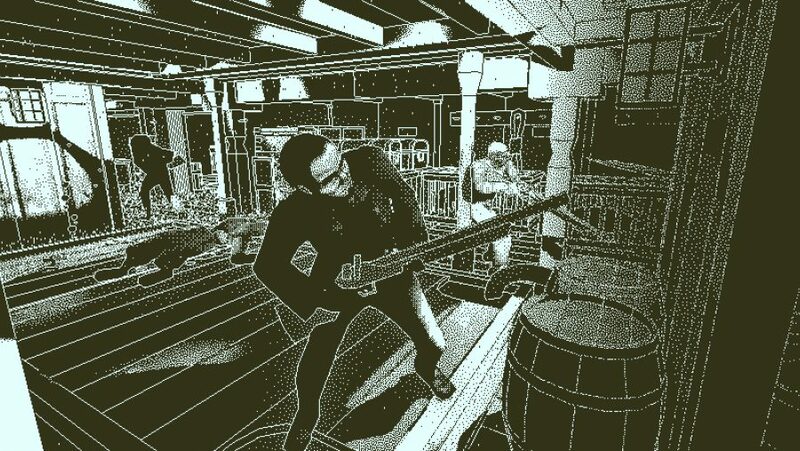 Return of the Obra Dinn is the latest game by Lucas Pope, creator of the harrowing border control sim Papers, Please. But Pope has left law for lore, and in Obra Dinn you’ll bear witness to things that have only ever existed in the gossip of sailors. It’s a self-contained ten-hour experience, and tells a chilling tale that grips you from start to finish. You’re equipped with two items to help you – a small notebook, and a pocket watch with a skull engraved into it. Within the book are several documents to help you solve the case: a mapped route of the Obra Dinn’s last voyage, a list of crew names and their roles, and several hauntingly stoic group portraits of the crew in black ink. The rest of the pages are blank, and as the fates of the crew start to come to light these pages are where you document your findings, filling out the details next to each person’s ghostly picture. The watch is for a weirder purpose. As you explore the Obra Dinn you’ll find bones and other… parts… of the crew, and activating the watch next to them sends you back to the moment that person died. The screen goes black, and you hear the events of the scene unfold. Then you’re plunged into a fully explorable vignette, frozen in time, allowing you to investigate the scene. These memory vignettes are where the main detective work will come in, and Obra Dinn leaves that completely to you. No hints, pop ups, glowing items, or footprints. Just good ol’ logical deduction and reasoning, so grab that pen and paper and get writing down details. After you return to the present, isolated and alone on the ship, it’s like the ghosts of the dead sailors have followed you. Return of the Obra Dinn is a captivating detective game with unsettling sights lying just beneath the surface. Hearing the events and deaths before you see them is what makes it unique – it heightens the tension and fills you with dread. Pope has laid down a carefully calculated story and then lets it go, like a message in a bottle, leaving it completely up to you to dive in and solve it. What you’ll find will thoroughly rattle your bones.